How to confuse people. 1. 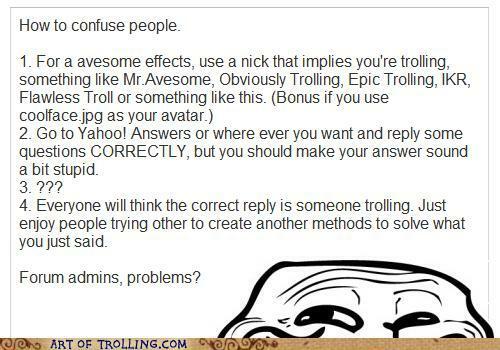 For a avesome effects, use a nick that implies you're trolling, something like Mr.Avesome, Obviously Trolling, Epic Trolling, !KR, Flawless Troll or something like this. (Bonus if you use coolface.jpg as your avatar.) 2. Go to Yahoo! Answers or where ever you want and reply some questions CORRECTLY, but you should make your answer sound a bit stupid. 3. ??? 4. Everyone will think the correct reply is someone trolling. Just enjoy people trying other to create another methods to solve what you just said.